Service is paid through the city and includes weekly trash with trash cart, recycling with a 65 gallon recycling cart, and yard waste. Residents have the choice of a 48,64 or 95 gallon trash cart and the price is based on the cart size and is billed by the city. Only non-hazardous household solid waste may be collected. Liquid waste products may not be collected in a liquid state. Non-hazardous liquids can be mixed with an absorbent such as Kitty Litter, but MUST be completely dry & with the lid off the container to show the driver that it is dried out. Trash with yard waste mixed in, will not be collected. Trash in cardboard boxes will not be collected. Items must be broken down or cut to four feet (4’) high/long or less and be bundled. Containers shall not have a capacity of less than 48 gallons nor more than 95 gallons, nor should they weigh more than 60 pounds. Rubbish (waste that rots and stinks) should be bagged AND the bag(s) should be placed in trashcans or trash carts. Republic Services will NOT be responsible for any rubbish spread about when animals or birds rip any such bag(s) open. Rubbish (waste that does not rot and stink) MAY be placed in plastic bags and set out for collection without having to be in a trash can. Please do NOT overload bags. They may rip open when picked up. Trash limits may not exceed the commonly produced quantity of a regular household family. Medically necessary needles (sharps), such as diabetic syringes will only be collected when in approved sharps containers, which are available from your syringe supplier or you may use a puncture proof container with a tightly closed lid. Bulky Trash includes any type of solid waste that cannot be placed into a 95-gallon trash can. Bulky Trash does NOT include major appliances, automobile parts or components, construction debris or any other such items. These items are to be serviced on the Trash day. There is no extra charge for this service. All Bulk items must be placed at curbside. All boxes need to be broken down and bundled. Republic Services requests that bulky items be limited to two (2) items per pick up. Please call Republic at (636) 947-5959 to schedule a bulky pick up. Major Appliances are to be scheduled for collection through Republic Customer Service. There is no charge for this service. Ewaste television and CRT monitors: $75.00 per item. Any other electronics: $25.00 per item. Must be scheduled by 5 PM the business day before trash pick up day and must be at the curb. Tires and Car Batteries will not be picked up. Construction debris has a minimum charge of $50.00-$75.00 per pick up truck load. There is no more than 2 standard sized truck loads per pick up. Must be curbside. Call Republic at 636-947-5959 to schedule and for more information. The above list is not all-inclusive. Please contact Republic with specific questions. Yard waste with trash mixed in will not be collected. Loose yard waste must be bagged in standard PAPER LAWN AND LEAF waste bags or placed in designated 32-gallon or smaller yard waste cans. YARD WASTE IN CARDBOARD BOXES WILL NOT BE COLLECTED. Yard waste cans are to be used for yard waste ONLY. Tree limbs and branches less than 4 inches (4”) in diameter must be tied (with TWINE – NO WIRE) in bundles no bigger than four feet (4’) long by twenty-four inches (24”) in diameter. However, no bundle is to weigh more than sixty (60) pounds. Limbs and branches six inches (4”) or more in diameter are considered Bulky Trash. Christmas trees will be collected at no additional charge.The tree must be free of all decorations. The tree may not exceed six feet (6’) in length. Do not use plastic tree bags, plastic cannot be mixed with yard waste. RECYCLING INFORMATIONThe City of Glendale participates in Single-Stream Recycling. 65-gallon recycling carts are provided to each single and two-family household for recycling collection. 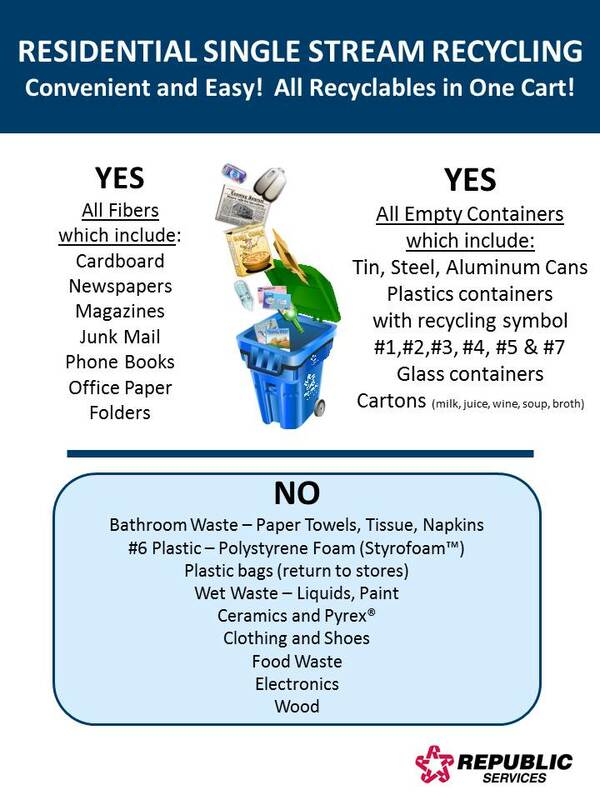 A recycling information guide is printed on each lid of the recycling cart to provide a listing of accepted materials for Single Stream Recycling. For collection please properly place the cart three feet from all obstructions or other debris. For more recycling information,click here. Click here for information on recycling and solid waste or call St. Louis County at (314) 615-8989. In order to insure collection of your trash, yard waste, and recycling, please put them out for collection at the curbside BY 7:00 AM on your scheduled collection day. The change in service days will be for that day on which the holiday falls. If the holiday falls on a Saturday or Sunday no change in weekly trash pickup will occur. When the holiday falls on a weekday, ALL days following a holiday ROLL. CUSTOMER SERVICE: The Allied Waste Customer Service Department is open to receive telephone calls from 8:00 AM to 5:00 PM, Monday through Friday of each week, excluding holidays.